NEW YORK, June 20, 2018 /PRNewswire/ — “Disruptive leaders like Jeff Bezos and Elon Musk have transformed companies, industries and entire societies while generating incredible wealth for themselves, their investors, their employees, as well as millions of other people,” says business disruption author John Furth. 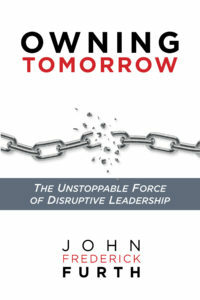 For over 25 years, John Furth worked with CEOs and their C-suite executives at some of the largest corporations of the world such as Sony, Deutsche Bank, Pfizer and Discovery Communications, helping them develop and implement disruptive and innovative businesses, leadership teams and organizations. Since 2015, Furth has been Vistage’s Chair for Brooklyn, New York, a role which allows him to draw on his experience and extensive network to coach and advise CEOs and business owners of NYC-based small and medium-sized companies. 1. They are “brainiacs.” While some well-known business disruptors never finished college, many received PhDs from the highest-ranked universities in the world. But they all have the same commitment to lifelong learning. 2. They often push accepted behavioral, cultural, legal, and ethical boundaries to the limit. Unfortunately, if some of their more extreme tendencies aren’t reined in properly, they can quickly destroy everything they and their team worked hard to build. 3. They’ve learned how to disrupt their own frames of reference and unproductive mindsets. This helps them increase their focus, ability to innovate, and to stay one step ahead of would-be competitors. Disruptive leaders expect and often demand their teams to think and act in the same way. 4. They look for information, insights, and inspiration in unexpected places. They recognize that the usual or “traditional” sources of data are by nature backward-looking and hence of limited value in a world that is being (re-) created. Great disruptors ask excellent questions and listen carefully to the answers because they never know when someone else might have an insight that could be useful to them and the business. • Provide goods, services and experiences that were previously only available to the most privileged members of society to a much larger percentage of the population more easily and affordably. • Give customers what they want, when they want it and how they want it. • Eliminate or reduce the things in people’s everyday lives they don’t want, from everyday annoyances like wasted time, boredom, complexity or unhappiness as well as life-threatening situations like poverty and disease. 6. They understand that disrupting an existing eco-system or process on a regional or even global scale can cause significant short-term negative consequences. Entrenched and inflexible companies are driven out of business, and many individual careers are adversely affected. However, the value created for billions of people far outweighs such negative incidents. 7. At some point they learn the ultimate paradox of disruption: “more stays the same than changes.” Like all successful companies, disruptive enterprises have to have the funding necessary to execute their plans, the right people doing the right jobs and the wherewithal and commitment to push through many breakdowns and hurdles. 8. They generate unimaginable wealth for themselves, their investors, their employees, and others connected to their companies.